Teeth yellowing can occur gradually, and may easily go overlooked. Fortunately, this is not typically a sign of any serious medical condition. 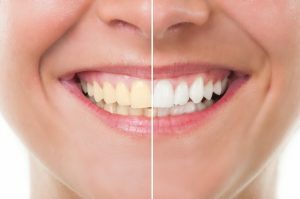 Although faded teeth may feel disheartening, and negatively affect your confidence, you can get it back with numerous different teeth whitening options. Nonetheless, Dr. Andres de Cardenas wants to outline some information concerning why your teeth might be yellow. Remaining aware of what causes yellowing, in addition to how you can avoid or mitigate exposure to these things is the first step towards achieving preeminently white teeth! Your teeth actually might begin yellowing due to the natural aging process. Tooth enamel may fade over time simply due to wear and tear. Many dental patients choose to maintain their teeth with professional teeth whitening procedures that can reverse some of these detrimental aging effects. From cigarettes to loose pipe tobacco, smoking stains teeth. However, this extends to chew and dipping tobacco as well. If you consume tobacco products, your teeth will fade, darken, and yellow over time. Brushing, flossing, and rinsing your mouth thoroughly all represent great teeth whitening methods. These remove plaque buildup, as well as tartar. Plaque and tartar speed up the yellowing and discoloration of your teeth. Antibiotics and other medications can darken teeth in young children. Additionally, some antihistamines and medicines for high blood pressure may stain adult teeth as well. It is important to discuss any potential side effects, including dental issues with a physician before you begin taking medication. Teeth yellowing due to illness is less common than other causes. However, diseases may negatively affect enamel. This may also occur as a result of treatments like radiation and chemotherapy. In these instances, the teeth display more of a brown than yellow discoloration. It is entirely possible to inherit enamel that imparts more yellow than those with a perfect white smaller. Fortunately, you can fix these issues by employing modern teeth whitening modalities. These include whitening strips, toothpaste, and rinses that can restore a perfectly white smile! The best way to prevent yellowing teeth is paying attention to the foods and drinks that you ingest, as well as abstaining from tobacco use. Committing to regular oral care and good dental hygiene can help you ensure your teeth stay white throughout your life. Dr. de Cardenas additionally recommends visiting a dental professional at least twice per year. Regular cleanings from a dental professional will help remove staining. Removing plaque and tartar building before decay begins is crucial to maintaining a whiter smile, in addition to optimally healthy teeth. Drinking through a straw may also minimize the time that staining compounds reside on the surface of teeth. If brushing your teeth in between meals remains impossible, you can also rinse your mouth out with water after consuming food or drink that may stain your teeth. 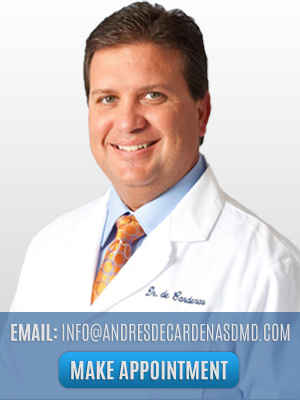 For more information on professional teeth whitening from our dental practice, contact Dr. Andres de Cardenas today to schedule an appointment!